Mary is a life long resident of Burlington County, New Jersey, and brings her Native American heritage into play with her handmade baskets. Many of her traditional baskets are shapes and styles with which her Lenape ancestors would have been familiar. She is a true artist and innovator who does not like to have her creativity stifled by following rigid set patterns. This is a concept Mary often stresses to her students, "I don't just teach people how to make baskets; I teach them how to be basket makers,” she often says. On the other hand Mary has a healthy respect for tradition. This is why she has researched and makes traditional baskets which her Lenape ancestors would have made. It is this blending of tradition and creativity that makes Mary Carty's baskets both unique and highly collectible. 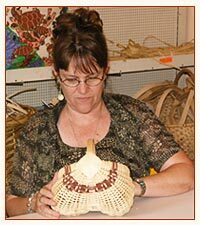 A talented basket weaver, Mary has won many awards for her original basket designs through the years, and has admirers throughout the world. When you stop in at Pinelands, you will usually find Mary weaving one of her beautiful baskets. She holds classes for weavers of all skill levels, and offers specialty classes as well. Mary is available to give demonstrations for your school, group or organization.